Flextronics turned to Workday and Collaborative Solutions to help modernize and simplify their HR needs for a fast-growing global team. Flextronics is a Fortune Global 500 electronics manufacturing services provider. They offer design, engineering, and manufacturing services to customers in a wide array of industries ranging from automotive to clean tech to consumer goods. Their customer roster includes companies like Dell, Microsoft, Casio, and Xerox. They have over 200,000 employees with operations in 30 countries across four continents. Flextronics is known for meeting its customers’ needs by using efficient processes, precise quality control measures, and socially responsible practices. Their internal practices, however, were not keeping up. Managing a large, fast-growing global team without centralized or automated processes was inconsistent with the high standards of their customer-facing operations. As a result, Flextronics turned to Workday and Collaborative Solutions to help modernize and simplify their HR needs. Numerous acquisitions over the years left Flextronics with ownership of over 80 different HR systems and hardly any cohesion from location to location. They wanted a solution to bring more unity to their company. In addition, they did not have automatic reporting, so data accuracy and employee productivity was constantly compromised. An early adopter of Workday, Flextronics chose to deploy HCM as their global, unified HR system. 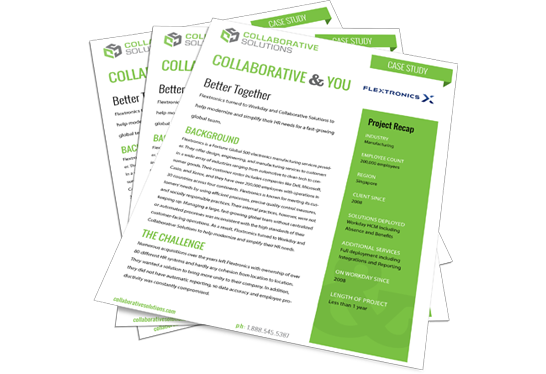 Collaborative Solutions staffed the entire functional team, involving the global workforce in the process and creating better ways for Flextronics employees to do their jobs. Specifically, Collaborative Solutions standardized their HR process worldwide, and implemented employee and manager self-service features to give more power to the workforce. With Collaborative Solutions and Workday, Flextronics now has over 80 different HR systems, consolidated into one unified system of record for employees everywhere. The cohesive system allows for unlimited growth, and keeps all 200,000+ employees’ information in a simple-to-use system.